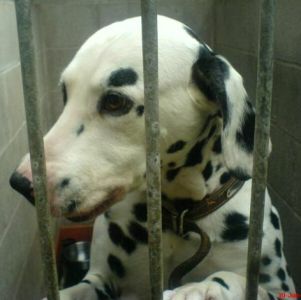 Lucky is a gorgeous Dalmatian who after being picked up by a local Dog Warden and ending up the stray "pound" certainly was very lucky to be offered a rescue space at Leicester Animal Aid. This lad is only 2-3 years of age and whilst in the "pound" it was very obvious that Lucky's urine was not as it should be. One of our volunteers kindly took him to see our vet and after tests he was diagnosed with Ammonium Urate Crystals, which appears to be quite a common problem in Dalamtians. Lucky spent his 7 days in the "pound" and nobody came to claim him. It is quite possible that this lovely lad was thrown out due to his condition which had obviously been neglected for some time, poor lad! Thankfully, Leicester Animal Aid still agreed to take in Lucky and despite his problems and initial obvious discomfort he has an adorable temperament and is proving to be a very loving and friendly lad. During his stay with Leciester Animal Aid, Lucky has received regular treatment for his condition, mainly a special diet which appears to suit him well and he is much better. This diet needs to be maintained at a cost of £40/week which is a struggle for the rescue who already have gigantic veterinary bills to pay. More than anything Lucky needs a home to call his own. Somebody who doesn't mind that Lucky is special boy and as such will need a special diet which is a little more costly than a standard diet. 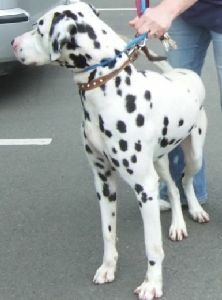 Lucky is a gorgeous lad with a wonderful temperament who really deserves to be in his very own forever home. If you feel that you can offer Lucky a loving home, please contact Leicester Animal Aid on 01455 888257. As Lucky was a dog that we asked Leicester Animal Aid to help us with and save him from "death row" we are now appealling to our supporters for help. Leicester Animal Aid desperately need help and support to fund Lucky's special diet, even if it's only £1 a week until Lucky finds his forever home, each and every penny helps. Please help Lucky by following the link below. This rescue has saved Lucky's life, please donate towards his care if you can. Thank you! You can make a donation by using the Nochex button below.